Located on the Eyre peninsula, Dakalanta Wildlife Sanctuary protects a diverse range of ecosystems. This crucial habitat supports a large population of the Southern Hairy-nosed Wombat, as well as a number of other species that are declining elsewhere. Dakalanta Wildlife Sanctuary protects over 13,600 hectares of the Eyre peninsula in South Australia. It forms an important connectivity area, strategically located at the southern boundary of Cocata Conservation Park and with other protected areas nearby forming part of the WildEyre Biolink program. Dakalanta is located on the habitat ecotone between the mallee woodlands to the north and the grassy woodlands to the south. The sanctuary supports a range of vegetation communities, including Mallee and Callitris woodland and Drooping She-oak grassy woodlands. It is home to a large population of the Southern Hairy-nosed Wombat, as well as several declining and regionally significant bird species. Dakalanta is part of the Polda Basin, which has a shallow ground water aquifer that recharges when local rainfall percolates down through the limestone. The region experiences cool, wet winters and hot, dry summers, which are somewhat affected by the nearby ocean. The southern portion of the property consists of low rises and flats of calcrete with very shallow soils, areas of which were cleared of the original Drooping She-oak grassy woodlands (which is now a threatened ecological community on Eyre Peninsula). The central and northern portion of the property supports more intact vegetation, on low sand ridges or shallow calcareous loam flats, both on the underlying calcrete sheet rock. Dakalanta supports around 250 plant species, including a stunning array of mallee species and upto 10 species of small ground orchids. In the southern portion of the property are open grasslands (some of which have been cleared) with remaining areas of Drooping She-oak grassland, and along the edge of the grasslands in slightly deeper soils are Mallee Box woodlands. 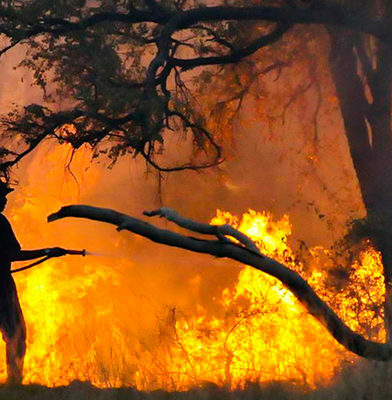 There are Native Pine woodlands (Southern Cypress Pine is increasing on the property due to reduced grazing pressure), low mallee woodlands with a spinifex understorey, as well as pockets of hollow-rich Redgum woodlands, and nectar-rich Swamp Paperbark shrublands. Dakalanta Sanctuary protects a number of important species including a large population of the Southern Hairy-nosed Wombat, which is in decline across much of its range. Other notable mammals include the Western Pygmy Possum and the Little Long-tailed Dunnart. Over 118 species of birds are confirmed or likely to occur on the property including the Peregrine Falcon, Scarlet-chested Parrot, Purple-gaped Honeyeater, Shy Heathwren and Restless Flycatcher. There is good habitat for Malleefowl, which occurs in the region. Revegetation of areas affected by stock grazing and fire. The revegetation program is funded by the federal government as part of the 20 Million Trees Program and managed by Landcare Australia. The program uses local seed sources, and is focused on restoring the threatened Drooping She-oak woodland in the southern part of the property. Targeted feral animal control programs. Feral cats and foxes are common in the region. AWC shoots both cats and foxes opportunistically, and also baits for foxes. 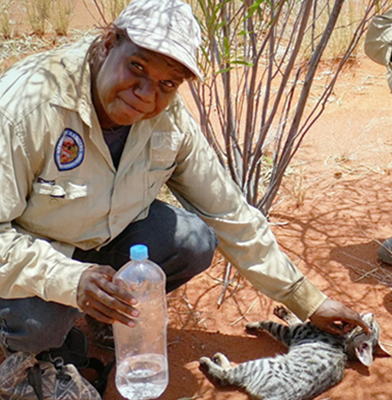 There is no landscape-scale control method for feral cats, but AWC is undertaking detailed research across a network of sanctuaries to develop a more effective method. Feral herbivores such as rabbits, goats, and deer occur in the region, and all are shot opportunistically. In revegetation areas, rabbits are baited to prevent them grazing on new seedlings. Biological surveys. 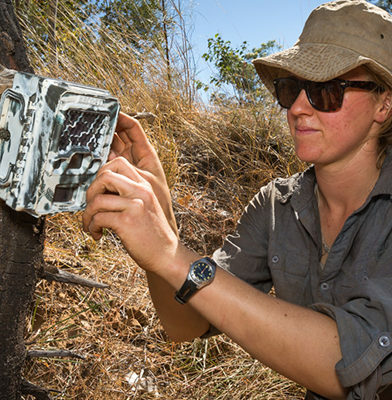 Every 3 years at Dakalanta, AWC staff measure a suite of ecological health indicators, such as the diversity and abundance of key faunal groups (birds and ground-dwelling reptiles) and the significance of threatening processes (feral animal activity, fire, weed occupancy). Our performance against these indicators provides rigorous scientific data, allowing us to track the ecological health of Dakalanta. The surveys are carried out at 41 sites across the property, and involve more than 5000 live trap nights and over 200 camera trap nights each survey. Wildlife at Dakalanta is under threat from loss of crucial habitat, and invasion by feral animals. Cats and foxes are a major threat across Australia, and prey directly on small mammals. Feral herbivores like rabbits and goats can be very destructive, and compete with native species for food and habitat. Often important habitat is already degraded from previous pastoral use. AWC is addressing these threats at Dakalanta through land management strategies like revegetation programs and the removal of feral animals. AWC protects populations of the Southern Hairy-nosed Wombat at Yookamurra and Dakalanta Wildlife Sanctuaries.